Line: West Virginia by 14. Both West Virginia and Baylor remain in the chase for spots in the Big 12 championship game, but can’t afford any more slipups the rest of the season to get there. Baylor had a chance to beat No. 6 Texas in its last game, but was limited to one touchdown over the final 35 minutes and couldn’t cash in from the Texas 17 in the final seconds of the 23-17 loss. Baylor’s pass rush against West Virginia QB Will Grier. 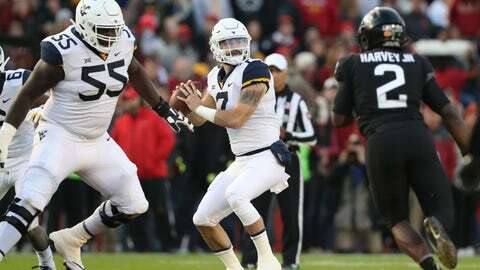 Grier was sacked seven times and held to 100 passing yards in a loss to Iowa State two weeks ago. Baylor has two of the league’s best pass rushers in DT James Lynch (four sacks) and DE Greg Roberts (three). However, the Bears have given up 15 touchdown passes, tied for last in the league with three other teams. Baylor: WR Jalen Hurd. The senior has three rushing TDs over the past three games, is averaging nearly seven catches per game and is fourth in the league with 622 yards receiving. West Virginia: WR David Sills. The senior hasn’t gone over 100 receiving yards since the opener against Tennessee. He has two TDs total in his last three games after tying for the national lead a year ago with 18. Both teams are coming off an open date after being held to season lows for points in their last games. … Baylor has been held under 100 rushing yards in two of its last three games. … The Bears have the league’s worst rushing defense, but West Virginia has the second-worst rushing offense and is tied for the league low with six rushing TDs. … Baylor QB Charlie Brewer entered last year’s game against West Virginia down 38-13 at the start of the fourth quarter. He rushed for 48 yards, threw two touchdown passes and nearly brought the Bears back. He was sacked on a 2-point conversion attempt with 17 seconds left and the Mountaineers escaped with a 38-36 win.